Love Wins in Frozen | Kid Reporters' Notebook | Scholastic Inc.
Caissie Levy stars as Elsa in Frozen, the hit Broadway musical. 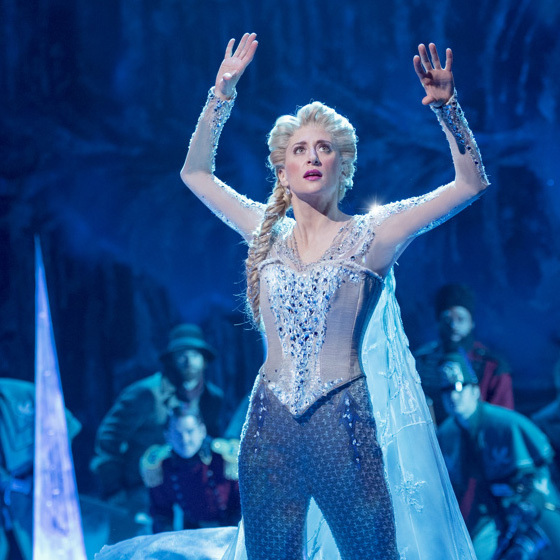 Disney′s Frozen has been dazzling sold-out audiences since the musical opened at the St. James Theatre on March 22. Based on the 2013 animated movie of the same name, the musical was nominated for three Tony Awards: Best Musical, Best Book of a Musical (Jennifer Lee), and Best Original Score (Kristen Anderson-Lopez and Robert Lopez). Frozen is not like traditional fairy tales. Its characters do not adhere to stereotypes, but instead portray women as kind, independent, strong, and powerful. The message: Love prevails. Join the choir, and get into community theater. Be kind and work really hard, and your reputation will speak for itself. Trust and embrace the things that make you different. Really work on those things. There’s only one you. That is what will set you apart from everybody else. Get some training. Acting is a craft. It’s something you learn. It’s something that you have to practice to get good at. It can take a long time for things to pay off. You just have to be patient and be ready for luck when it shows its head.